Letter: money for Central Library…but not for community libraries? 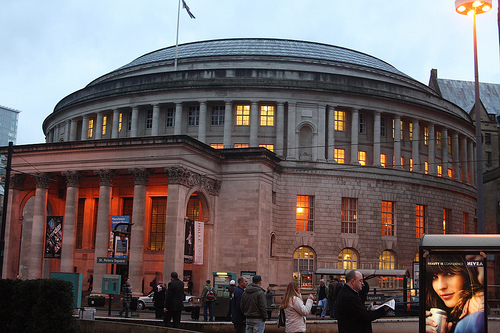 The Manchester Evening News reported on a £500,000 donation to Central Library. At first glance it might seem impressive that the Wolfson Foundation can donate such a large figure to a public library. But this money is to carry out the “wish list” of culture bosses, after £48 million has already been spent. The wish list includes new furniture and what must be a very expensive clock repair. On top of this, while the council attempts to close six community libraries , they are asking people to give more money to this one central facility in the form of a charity they intend to set up. It seems a pity that those talking to Paul Ramsbottom, head of the Wolfson Foundation, who said, “Public libraries continue to play a crucial role in British Society”, did not let him know for example that Burnage library is due to close but costs just £42,000 a year to run. Keeping facilities like this going may have greater benefit to the city than focusing so much one one library. Impressive and treasured as this library is, surely we should value the city wide provision and have a more balanced approach to library services for all council tax payers? Many residents will never use Central Reference Library; local provision may make all the difference to their educational achievements and life long interests. Local libraries are not used much. Broadly speaking the middle classes buy books and the working classes don’t read them, probably because they spend a staggering 4 – 5 hours A DAY watching TV. We spend £3.5 billion per year of revenue from a tax on TV use to fund trashy TV like Eastenders and the rest of the dumbed down product that makes up at least 80% of the state broadcaster’s output. This money should be used to fund good library services and sporting facilities that might, just might get the TV watching section of their couches and away from the TV. But while the state itself ensures the mass manufacture of a huge amount of junk TV the future of public libraries is very bleak. Pete, From your comment,it does look as if working class people are ignorant box watchers. I don’t think this is borne out in fact. The Council so called consultation meeting at Burnage library on the 16th,attracted about 150 people including some teachers, who were irate at the prospect of the library closing. They did not like the idea of losing a reading and computer using facility in the heart of the community. However, I do think the libraries should be promoted by the Council and the range of books, DVD’s, CD’s etc expanded. It would also help to attract people away from the TV if there were organised discussions of particular books and perhaps speakers on books and authors and perhaps subjects. The working classes are avid box watchers, and a lot of what they watch is utter rubbish produced by a government funded broadcaster, rubbish which simply duplicates the rubbish made by commercial TV companies. That’s the same government which says it wants people to read more, exercise more, and that it is short of money for things like libraries sports centres and swimming pools. I’m not sure how these three things square with the £3.5 billion pounds per year the government feels it is justified in spending on trashy TV programmes. TV is a notoriously sedentary activity, and many studies have shown that it is linked to a decline in reading and many other more useful activities like participation in sports and hobbies. Just as we don’t spend the taxes on alcohol and tobacco on providing the population with state funded rations of alcohol and tobacco, there is no need for the government to spend the tax on TV on manufacturing junk TV. Why not spend it on libraries, sports centres and swimming pools? No tax rises are need, just a reallocation of the tax on TV use to something beneficial. However, when the state spends such huge quantites of public money on junk TV, and the public generally enjoy watching it, I think we see why libraries are in steep decline. When they have their TVs, people don’t want libraries and don’t go to them. There is a problem for those of us who live in a city; we fail to realise that those who live in the countryside are likely to have zero useable access to libraries. AFTER the recent cuts to the library service, the city council reported that 99% of the population of Manchester would STILL have a library within 2 miles. The achievement of that coverage across the whole country is inconceivable; we do well to resist the temptation to defend what is, in a wider context, indefensible. Until the government stops financing the mass manufacture of junk TV the libraries are doomed. Bruce, this business about a library within two miles is a red herring. The two miles is as the crow flies and most of us don’t have wings. The Councils own consultation elicited the response that 60% walk to their local library.Most who are effected by the closures will not be able to do that in less than malf an hour. Older people and children will need to go on at least one bus if they live in Burnage. Strangely Didsbury and Withington libraries, only 10 minutes walk apart on a main road are not being downsized or closed, but Burnage and Fallowfield, in deprived areas are being closed. What a surprise?